I don't recall the last time I was at this restaurant but it certainly has been a few years. I don't often go up to that area anymore but we were going to a movie house nearby and I had seen a coupon "DINNER FOR TWO $25". It consisted of one appetizer: Onion Loaf. There are 2 choices selecting from Baby Back Ribs or a half BBQ Chicken or BBO Chicken and Ribs with each coming with a side. Last but not least there was a choice of ONE of the following: Key Lime Pie, Ice Cream or Chocolate Cake. 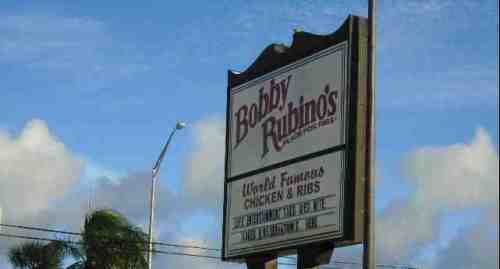 It sounded like a good deal so after the movie we went to Bobby Rubino's. Our server Katelyn--yes she has heard all the jokes so we didn't say anything!--said we could have one of the other many appetizers and $4 would be taken off that price but we decided to stay with the onion loaf which turned out to be a good choice. It wasn't too oily and had a good coating. I had the BBQ chicken and ribs while Allen had the half BBQ chicken and we both ordered a side of crazy rice. I liked my chicken and ribs though the sauce was a bit too sweet while I found the rice too lumpy as if it had been cooked much too long. Allen disagreed liking his but he is not a lover of BBQ (what does he know?) but did a good job on the chicken. It turned out that in very small print was "Each dinner must include the purchase of a beverage" so we each had a diet cola adding $5.50 to the check. With the addition of $1.83 tax the check came to $32.33. Attached to it was a check showing what it would have cost without the coupon it came to $50+ and I like that as the server should be tipped on that bill, not the reduced one! Katelyn did a great job as a server whether refilling drinks before we had to ask, bringing extra napkins and wet naps, keeping the table clean and just all around being pleasant. You know Bobby Rubino's has been in business awhile--over 30 years at this location--as they still believe in serving a hot loaf of bread with your meal!